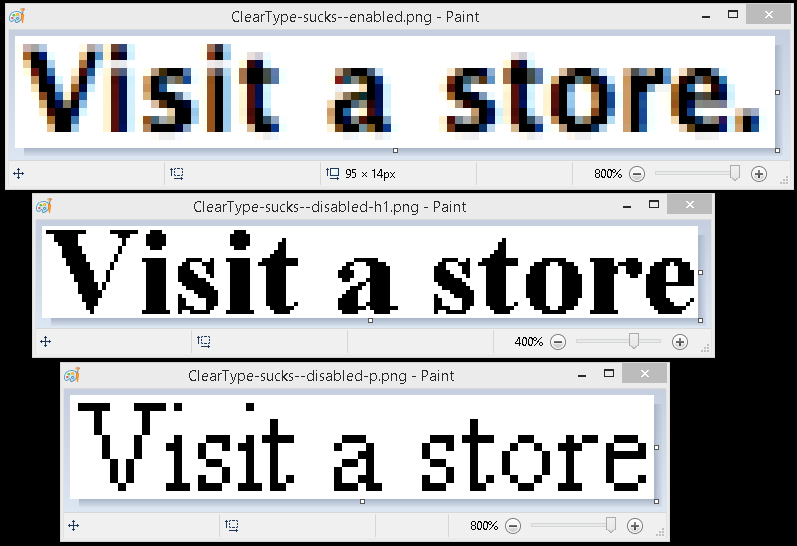 Please do continue disabling subpixel rendering (ClearType)! Zoom in on your subpixel rendered text in the screenshot and tell me if it looks good. It won't. The text is going to be all miscolored and blurry as shown below. And look at the file size too! Subpixel rendering increases it by 50% or more. I cut your example picture in two and then saved each half in a separate png file. The left side was 10 KB, and the right side was 15 KB. The results speak for themselves. Don't screenshot subpixel rendered text. And don't ever zoom in on screenshots of subpixel rendered text. Your friendly neighborhood ClearType hater. p.s. : I even like the example on the left more. Exhibit A looks better. And I use an LCD screen. UPDATE: I left my comment a year ago, it has still not been approved. UPDATE 2: And now all comments are disabled on the blog post. Way to go, every counterargument deleted. Glad I saved mine to where you cannot reach.